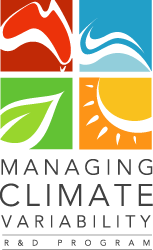 increasing knowledge and confidence to adopt climate risk management. Our latest funding period (MCV V) runs from 2016 to 2020. Our program builds on more than two decades of climate research by its predecessor, the Climate Variability in Agriculture Program, established under the National Drought Policy in 1992 and extended under the Advancing Australian Agriculture initiative in 1998. The program’s consecutive funding periods have supported research through Managing Climate Variability I, II, III, IV and now V.
MCV has supported research for over 20 years; our completed projects reflect this body of work. Independent evaluations show that the research and development we have supported is substantial, with high benefit-to-cost ratios. For each dollar spent, there has been a return of over $6.60. We are funding climate science projects aimed at improving the skill and value of climate forecasts and outlooks, particularly from multi-week to intra-seasonal periods. Our projects focus on issues of interest to agriculture, such as forecasting extreme events (droughts, heatwaves and frosts) and investing in improved modelling capability. In 2014, The Centre for International Economics (The CIE) estimated the potential value of improved seasonal climate forecasts for the agricultural sector and for other sectors of Australia’s economy. The potential value for the agricultural sector is significant (ranges from $958 to $1,930 million per year), and much greater than the potential value for other sectors in the economy. With even more climate variability expected under climate change, they expect that value to increase. We continue to invest in delivering climate products by translating climate forecasting research outputs into climate forecasting products and services for Australian agriculture. We support research into decision-support applications and products. By investing in tools such as the CliMate app, we are giving farmers information in more convenient and accessible formats to support their on-farm climate risk management decisions. We continue to support knowledge and communication activities. Our investment in this area is focused on increasing awareness and promoting adoption of climate risk management practices on-farm through the Climate Kelpie website and other communication products.